Urbego mini training course trainer: Colin Wilson, Startegic Planning Manager at Greater London Authority. That should ring alarm bells. If the man in charge of London’s skyline can’t spell his own job title, we’re in deep trouble. 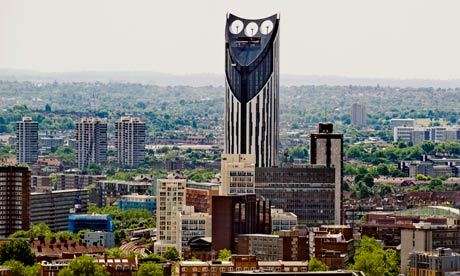 Colin’s no longer running mini training courses, he’s doing some startegic planning instead, in charge of sticking up lots of glass boxes around London – 230 of them – and there’s a very funny Guardian article about these buildings of ‘breakfast-extracting ugliness’ here. Of course it’s all about flogging luxury space to foreigns, regardless of London’s formerly unique character. After the Blitz, the City of London employed two police constables full time to take pictures of all the burned-out buildings. Arthur Cross and Fred Tibb built up a complete record of what needed to be reconstructed, so that planners could take into consideration height, bulk and materials. So they haven’t been planned then. The council’s development monkey can now set about dropping thuggish glass stumps wherever he wants. Usually they have something bolted onto them that’s hilariously intended to give them ‘character’. Last year’s fashion was upright coloured glass panels. This year’s fashion is spiky rooftop knives, thus lending each tower the elegance of an orthopaedic boot attached to a withered foot. I’d post a photo of Mr Wilson but I don’t want anyone shooting him. He’s probably a very nice man, hopelessly, terrifyingly out of his depth. And yes, this piece is another excuse to run a horrible picture of the Strata building, in Sarf London. You know, the one with the turbines that don’t work. The one that looks like an owl mated with an electric razor. I am surprised, it’s not like the Guardian to put out a piece of journalism without checking their facts first, is it? Most of the blocks in the linked article look dull, but some are just horrible. It’s a shame the BBA blog isn’t still running they’d have a field day with that lot. No one (except the thousands of tourists) expects London to look the same forever but this is high end madness. I don’t understand the London governance system but surely planning should be regional- Greater London, does it exist? This sounds incoherent but that’s the feeling I have. Thousands and thousands of expensive flats but where are the reasonable homes for working people? Truly digestion disrupting. Why aren’t there street marches? Startegic. Nice. And then there’s the tractical. And the fillowsophical. There in lies the problem, Greater London is vast and even with the best will in the world it is impossible to keep all the snouts out of a trough that big. I’d like to say it’s the money but as Dubai has shown it’s the promise of money. All eyes are on a sparkling future, not the current financial problems. It’s like the Victorian rail building craze. In Manchester we’re not as bad, but planning is a haphazard at best, there are always tall cranes across. The Hilton (Beetham Tower) is a drear building, the outside made to look like it’s permanently wet so that fits in with Manchester, but the blade on top was designed to make the building disappear into the clouds, even without the red lights for air traffic it doesn’t work, it looks like a big fence on one side of the building. It adds a touch of idiocy to this cantilevered dull looking building. The Council of Tall Building and Urban Habitat. London has now lost the Euro crown for tallest buildings, it’s gone to Moscow which now boasts some of the ugliest buildings to compete with London. Although St. Petersburg is due to take the crown.